As BSH’s Editor-in-Chief wandered off into the night, John Pope wandered into the Dun Cow. The house trio’s fixer and hard-working bassist Paul Grainger eyed JP’s arrival, and, in next to no time Grainger was at the bar as Pope gave him a spell. 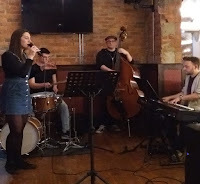 JP was joined on the stand by Newcastle Uni’s final year music students (the Dun Cow could be their local) Ben Richardson, piano, and drummer Harry Still. * These lads have impressed sitting in at the Jazz Café’s jam session and they seemed up for it here in Brandling Village. And whatever lies ahead for them, in years to come they’ll look back to the time they worked with vocalist Alice Grace! Yes, the fabulous Ms Grace returned to the stand, as did the horns of Johnson and Probyn, to sing Night and Day. AG’s scatting is second to none, and, having attended (and reviewed) countless gigs, your reviewer has heard nothing better, anywhere, anytime, it’s as simple as that. And as a finale, it was all in for a rollercoaster ride on Caravan. 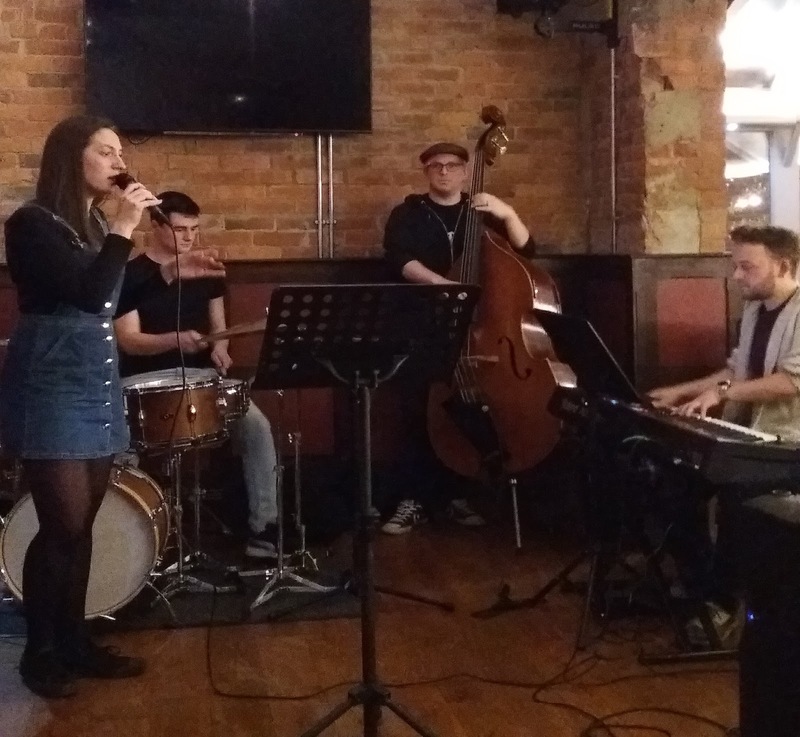 The Dun Cow’s jam session runs fortnightly Wednesdays (next one April 25). The alternate fortnightly Wednesdays feature gigs. If you’re around next week (April 18) it’s Julija Jacenaite singing to Alan Law’s piano accompaniment. * Ben and Harry, along with many other students, are soon to give their degree recital final performances. Members of the public are welcome to attend, keep an eye on BSH’s listings for details of times and locations. We wish Ben, Harry and their fellow students the best of luck. Russell will have the support of all us jazzers - many long past studenty time - in wishing the best of luck to all the final recital guys (and gals?). Exciting times ahead for all of you!